The average heat flow coming from the bowels of the earth, equals 63 ergs/sec· cm². The average amount of heat that the Earth receives from the sun equals to 34 0000 erg/sec· cm² (Verhoogen, et al, 1970). That is, almost four orders greater. There are no other sources of heat entering onto the ground. Consequently, the cause of ice ages and Interglacials alternating need to look in the mechanisms of changes of heat flow coming from the Sun. Heat flow of the Earth in this case can be ignored. The amount of solar radiation at some point in the Earth depends on latitude, season, and position of the Earth in its orbit relative to the sun. The first two parameters (latitude and date) by themselves do not affect the lighting. Changes in the amount of heat depends on the variations in the Earth's orbital parameters (its position relative to the Sun), and they are well known. This is, firstly, the variation of eccentricity (ellipticity) of the orbit of the Earth, which, due to changes in distance between the Sun and Earth, affects the total amount of heat coming to the Earth. If you change the eccentricity, the amount of heat falling on the Earth, will also change as at aphelion the Earth moves away from the Sun and at the perihelion is approaching. The greater the eccentricity, the greater the amplitude of the change. Secondly, it is the variation of the angle of inclination of the Earth's axis. They determine the contrast of seasonal differences. By increasing of angle the contrast increases, with decreasing - will decrease. And third, the shift of the equinoxes (the precession of the equinoxes), which leads to the fact that the position of the northern and southern hemispheres of the Earth relative to the Sun at any point in the Earth's orbit (including at perihelion, aphelion, spring and fall equinoxes) during halftime of the precession is reversed. A complete cycle of changes in the eccentricity is completed within 92 thousand years. The period of tilting the Earth's axis is 40 thousand years. The cycle of the precession of the equinoxes is 26,000 years (Verhoogen, et al, 1970). Winter comes twice a year on the planet. One time it is in the northern hemisphere and one time - in the south one. If any astronomical effect (other things being equal) lowers the temperature in winter, it will lead to an increase the distribution of snow and ice cover in a hemisphere, where there is a decrease in temperature. As a result, due to increased reflectivity (that the snow may have up to 80%), any amount of radiant solar energy is reflected back into space. The consequence will be an increase in the duration of the winter season, since the amount of solar radiation absorbed by the Earth, reduced. Thus, any decrease in winter temperatures triggers a positive feedback in the form of increasing the albedo, which further lowers the temperature and increases the duration of winter. Clearly, a positive feedback mechanism is initiated at all climatic zones of the Northern and Southern hemispheres (the farther from the Sun, the less energy) in the case of increasing the eccentricity of the orbit of the Earth in proportion to the amount of solar radiation. By increasing the angle of the Earth's axis north and south boundaries of the polar circles descend to lower latitudes, and the boundaries of the northern and southern tropics, respectively, will rise. As a result, the region of polar night shift more toward the equator in both hemispheres. The angle of rotation of the Earth's axis varies between 21°58' to 24°36'. These changes include in northern and southern hemispheres about 0.3% of the Earth's surface. Consequently, variations in the Earth's axis tilt cannot be the cause of global Glaciations. The area of their climate impact is limited only by the Arctic and the Antarctic. The alternation of the seasons on our planet caused by inclination of the orbit of the Earth, which now stands at 23.5°. The amount of solar radiation reaching the Earth per year for tens or hundreds of years can be considered constant. However, its distribution over the hemispheres is not always constant. Both hemispheres receive the same amount of solar heat only if the Earth's axis is perpendicular to the major axis of the Earth's orbit at perihelion and aphelion. This (average) position was slightly more than 6000 years ago and will happen again (only with the opposite position the axis of rotation) in about the same time. As stated above, this is caused by the precession of the equinoxes, which leads to the fact that the axis tilt of the Earth at perihelion (and other characteristic points - aphelion, spring and fall equinoxes) changes on 180° during half cycle of the precession. Currently, the northern hemisphere at aphelion turned to the sun. Accordingly, the southern hemisphere at perihelion turned to the sun. At aphelion as the most distant point from the Sun, the Earth as a whole receives less heat than at perihelion. This means that now the summers in the southern hemisphere are hotter, and winters - are colder. And vice versa - in the northern hemisphere the winters are milder and summers are cooler. Consequently, the inclusion of positive feedback in the form of an increase of areas with high albedo (snow and ice) is now in the southern hemisphere. The Glaciation is really happening in the southern hemisphere now. Antarctic ice sheet is the indication of this Gaciation. And in the north, respectively, the Interglacial occurs now. It may be added that the area of the ice sheet in Antarctica are currently about 14 million square kilometers. It is concentrated to 90% of the planet ice - 10 times more than in the Greenland shield. The maximum thickness of the ice dome of Antarctica is 4,800 meters. This is almost twice more than the maximum thickness of the ice sheets of the past Valdai Glaciation in the Northern Hemisphere. Development of Glaciation in the Southern Hemisphere is hindered by lack of land in the southern half of the middle latitudes. Vast areas of Eurasia and North America in the northern hemisphere are located here. Therefore, Glaciation in the southern hemisphere does not result in a significant decrease of the level of the oceans. Glaciation in the Northern Hemisphere ended about 10,000 years ago. We are now approaching to the peak of the precessional event when the axis of rotation of the Earth at perihelion and aphelion will be exactly along the Earth-Sun line. The consequence of this will be the maximum Glaciation in the southern hemisphere and a peak of warming in the Northern Hemisphere (global warming). In summary the following conclusions. The causes of ice ages are the sum of two factors - the precession of the Earth's rotation axis and the variation of the eccentricity of its orbit. Precession causes the alternation of glacial and Interglacial periods, and variations of eccentricity are responsible for the contrast ratio of the glacial phases - it increases if the eccentricity increases, and vice versa. Variations of the inclination angle lead to changes in winter temperatures only in the polar regions and the for extent of Glaciation have no effect. And definitely do not affect the frequency. The periodicity of Glaciations (and Interglacial) is determined by the precession of the equinoxes only. It is 26,000 years. Glaciation in the southern and northern hemispheres are replaced by Interglacials in antiphase - when the Glaciation takes place in the northern hemisphere, at the same time the Interglacial is observed in southern hemisphere, and vice versa. The scale of Glaciation in the Southern Hemisphere is limited by the lack of land in the southern mid-latitudes. In addition, the development of Glaciation even on a relatively small (compared to the land of the northern hemisphere) area of Antarctica has its limitations. The increasing of the ice sheet thickness is compensated by the acceleration of gravitational flow of ice into the sea as icebergs. Mainly so that any significant reduction in sea level during Glaciation in the southern hemisphere does not occur. Another astronomical factor has an essential impact on the climate of our planet. 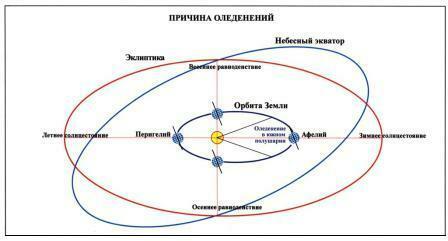 This is the superposition of orbits of the Earth and the Moon at perihelion. Once every 2000 years the projection to the ecliptic of the major axis of the lunar orbit coincides with the Earth-Sun line at the perihelion. As a consequence, the sum of the tidal forces of the moon and the sun take place. As a result, the tidal force is increased by 12% relative to the minimum values. This leads to the emergence of internal ocean waves, whose raises to the surface the mass of cold water, which cools and saturates with moisture atmospheric flows. That, in turn, leads to global cooling and humidifying the Earth's climate as a whole. That, in turn, leads to global cooling and humidifying the Earth's climate as a whole. Swedish climatologist Petterson discovered this phenomenon at early last century by (Petterson, 1914). Perhaps methane hydrates (CH4 • H2O) of the ocean floor play a significant role in the formation of deep waves. Methane hydrates in normal conditions are in equilibrium with the dissolved methane in water (Byalko, 2009; Kennett et al., 2000). Temperature increase or decrease in pressure breaks this balance, and the methane is released from the sediments. The decrease in pressure caused by tidal forces induces methane hydrates effervescence. They pull the cold water masses up, that causes an effect fixed by Petterson. Terraces of inland water bodies of the Earth demonstrate the high climatic contrast of the 2000-year cycle. (Shnitnikov, 1969; Matyushin, 1996; Ianina, 2009). For example, the range of fluctuations of the Caspian Sea, due to this cycle, is more than 70 meters in the Holocene and 150 meters during the last Glaciation. The Earth's climate during the periods between the superposition’s passages drifts toward aridity. This is the reason of the climate crisis in the temperate zone. Climatic zones shift northward, in place of a steppes the desert appear, forest-steppe becomes steppe, forest zone boundary shifts to higher latitudes. Levels of inland water bodies go down, rivers shallow and disappear, the population moves to the lower terrace. In addition, due to melting of continental ice increases slightly the level of the oceans. This means that variations in the levels of the World Ocean and inland waters caused by a small 2000-year cycle, are in antiphase, while the amplitudes of the levels are non-comparability. The amplitudes are comparable, if we compare the variations in Sea level caused by large cycle, and variations in the levels of inland water bodies due to small cycle. 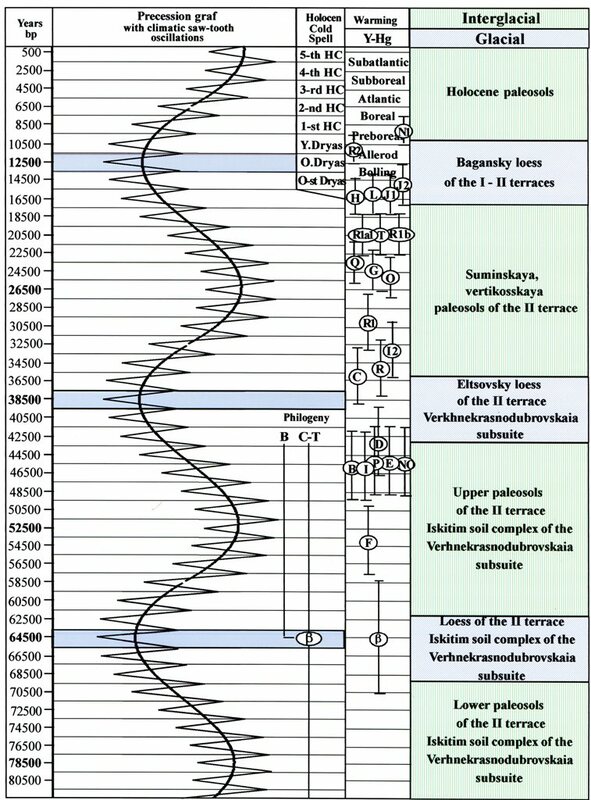 In Table 1, a large precessional cycle is presented in the form of a sinusoid with a period of 26,000 years on which as on the axis (in the form of a sawtooth curve) superimposed graph of the small 2000-year cycle. To the right of the sinusoid is a phylogenetic tree of Y-chromosome, constructed according to Klyosov (Klyosov, 2011) and to Klyosov and Rozhanskii (Klyosov, Rozhanskii, 2012). Even more to the right are the climatic and the lithological column, which includes the Sernander Blitt chart with added 1-5 HC – Holocene Coolings (Matyushin, 1995), ages of palaeosoils of the Russian Plain (Sycheva et al, 2007; Simakova, 2008; Anikovich et al, 2007) and a scheme of alternating of Glacial and Interglacial periods in the northern hemisphere. 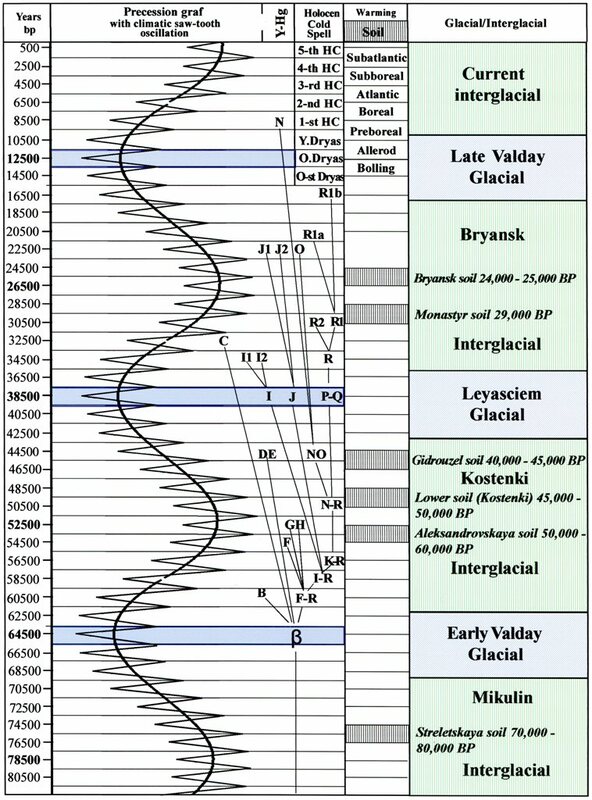 Comparison of these data shows that in addition to the Mologa-Sheksna Interglacial, which corresponds to the Monastery soil and the Bryansk soil, the another Interglacial period occurred during the Valdai Glaciation, which is labeled by Gidrouzelskaya soil, lower Kostenki soil and Aleksandrov soil. This Interglacial is indicated in the tables by working title "Kostenki Interglacial." To the left of the curves is scale, indicating the time (years ago) coordinate which is the time of the passage of the constellation's center. The Table 2 shows the comparison of climatic curves with the undisturbed soil-loess section in Western Siberia for the period of 130,000 years. Geological material is taken from the generalizing work of S.A.Arhipov devoted to the chronology of geological events of the Late Pleistocene of Western Siberia (Arkhipov, 1997). 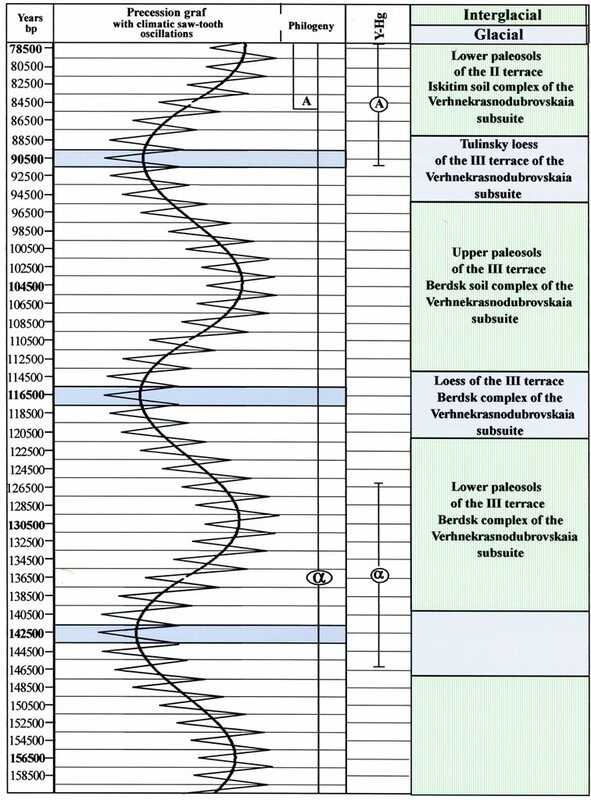 As can be seen in Table 2, in the soil-loess section of Western Siberia, as well as on the Russian plain, Kostenki Interglacial period is determined confidently. Kostenki Interglacial corresponds to the Upper soil of II terrace of Iskitim soil complex of Verhnekrasnodubrovskaia subsuite. In Table 2 the phylogeny and ages of the major haplogroups of mankind is shown to the right of climatic curves. This Y-tree was calculated by A.A.Klesov and I.L.Rozhanskii using the slow 22-marker panel (Klesov, 2011; Klesov, Rozhansky, 2011). The comparison of Y-tree and curves shows that the periods of origin of haplogroups are directly related to global climate change. In Tables 3 and 4, the comparison of climatic events with the archaeological data (mainly on the Russian Plain) and the paleogeography Ponto-Caspian (Yurkovets, 2011b) are presented. Climatic events, caused by large and small cycle, are marked in color. Coolings are marked with blue background, warming – yellow one. As can be seen in the tables, changing of archaeological cultures and fluctuations of sea levels (in spite of the fragmentary study of sea levels) are distinctly correlated with the astronomical cycles and are subject to them. Speaking of the territory of the so-called "LGR" - Last Glacial Refuge, it in northern Eurasia was: the Russian Plain to south of the Northern ridges (Severnye uvaly), and further to the west (schematically): to the south of the Vologda - Gomel - Warsaw - Berlin - Amsterdam – London line. To the east, it was (schematically too): to the south of Perm - Magnitogorsk - the foothills of the Altai - Barnaul - Tomsk - Vilyui - Yakutsk - Okhotsk – Anadyr line. From the south, LGR was limited: the mountain systems of Europe - Black Sea - Caucasus - Caspian Sea - the mountain systems of Asia. This scheme is obtained if we consider the "maximalist" hypothesis of the ice sheets of Grosswald (Grosswald, 1989). Other variants of the spread of Glaciation more formally expand LGR. However, the area suitable for living, does not become larger. The fact that the climatic zones within the entire field of LGR were significantly narrowed compared with Interglacial periods. Thus, in the widest area of the Russian Plain the shrub tundra, which began about 60° N, was replaced by severe periglacial steppe and semidesert already to 50° N (Simakova, 2008). Under these conditions, the most biologically productive area was the one adjacent to the outer edge of the terminal moraines. These were sandurs (outwash plain). Here, deposition of material brought by glacial melt waters occurred. Sandur landscape - is undulating plain formed by alluvial products of water redeposition of moraine. Sandurs, with their abundance of water and biological resources, are the place most appropriate to the life and appealing to the population of ancient cultures (Sorokin, 1997). In Western and Central Europe, such cultures were Magdalenian and its related Hamburg, Federmesser, Ahrensburg, Creswellian and Swiderian cultures. In Eastern Europe - Ressetinskaya culture. In Siberia and the Far East these cultures were Maltinskaia, Afontovskaya and Diuktai cultures. In North America this was Clovis culture. 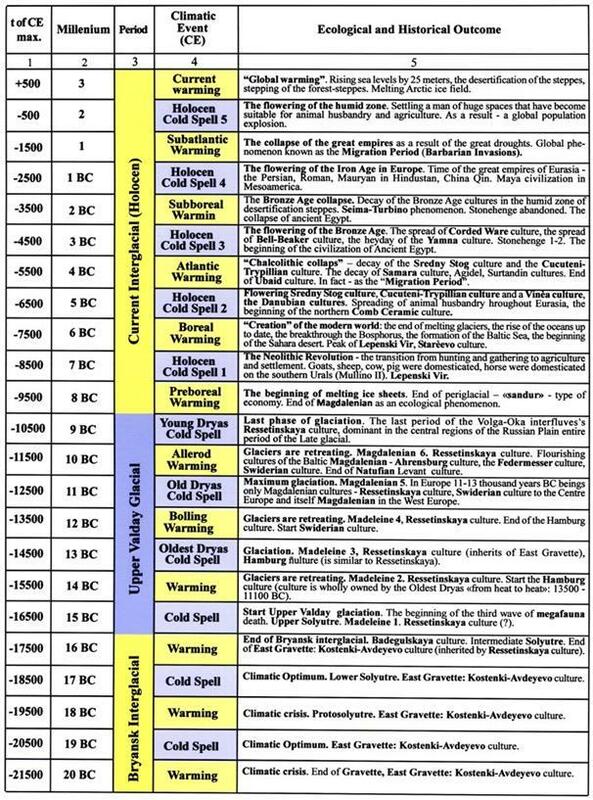 Global warming is the eighth millennium BC meant the end of the Magdalenian (in the broad sense - together with its sister cultures) as an ecological phenomenon - as a way of economy associated with sandur ecology. The last of its culture - Swiderian and Kunda (Poulley) in Central Europe, Butovskaya culture in Eastern Europe (the Volga-Oka interfluve), Clovis in North America - at that time ceased to exist (Yurkovets, 2011a). Thus, "the Refuge of the Last Glaciation» (LGR) - it is rather narrow zone stretching from west to east for thousands of kilometers. But not a local, geographically isolated area. It is clear that migration in the period of Glaciation was limited on this narrow strip, which expand and shrink during cooling and warming, caused by a small cycle. 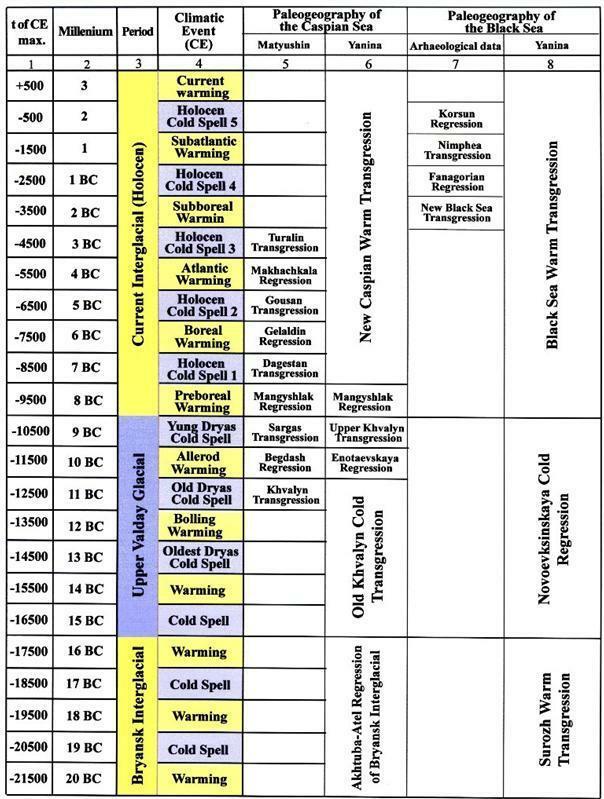 Change of Magdalenian cultures within the period of Glaciation is subject to this small cycle - see Table 3. This narrow band was broken by meltwater discharge system along the line Mansiysk dammed glacial lake - Turgay - Aral - Uzboy - Caspian - Manych - Black Sea into two unequal parts in the period of three (possibly four) thousand-year peaks of Glaciation (16500?, 14500, 12500, 10500 years ago), separating the European LGR part from the Asian one. The discharge system accumulated runoff of the main rivers of Siberia - the Ob, Yenisei and Lena even. The duration of such separations was about 1,000 years old - the last glacial transgression of the Caspian Sea lasted such time roughly, which is fed by runoff of this system (Grosswald, 2009). In the intervals between the peaks of Glaciation Mansi-Caspian channel ceases to exist, resulting the torn area of Eurasian LGR was again connected. Almost the same thing (and in the same periods of time) occurred during the period of Glaciation in Beringia. But the territory of LGR Asia, and America broke the ice sheet, rather than a powerful flow of dammed waters. In the intervals between the peaks of glacial ice sheet decreased (15500, 13500, 11500 years ago) and Diuktai culture natives along not flooded, but partially ice-free Beringia could penetrate to the American continent. 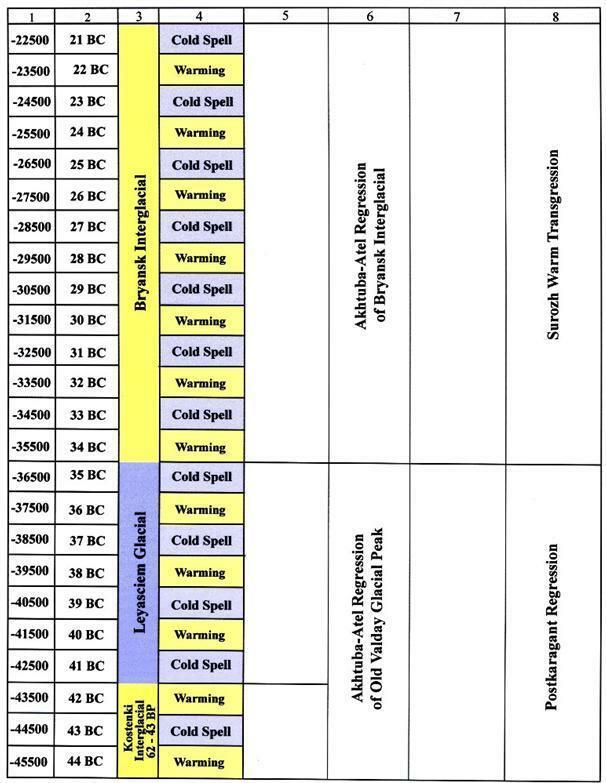 The same frequency of changes of cultures is observed in Interglacial - see Table 3. 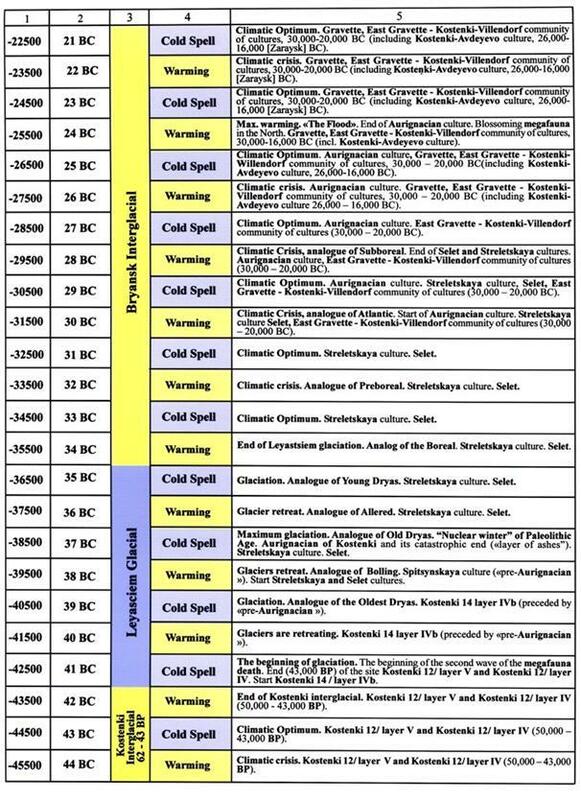 The temperate climate zone in the periods of warming becomes a zone of ecological crises, which leads to the collapse of the current stage of human development - "The Creation", "The Catastrophe of Chalcolithic", " Bronze Age Collapse", " Migration Period" (Yurkovets, 2011a). There is the beginning of a new crisis now. Multiple signs of the coming crisis became known as "global warming". During periods of cooling and moistening of climate, flowering of civilization and the growth of the population has always been observed. That was the last millennium. P.S. Temperate climatic zone is currently at the beginning of the next climate crisis caused by the warming of the minor cycle - see Table 1. The peak of this crisis will come in about 500 years. However, a new factor intervenes in the natural course of climate events now. It is the increase in atmospheric concentrations of greenhouse gases. This factor was not present in previous eras. Therefore, its impact on the dynamics of the small warming cycle was not studied absolutely. However, it is clear that increasing of the carbon dioxide concentration, which is released into the atmosphere by burning coal, oil and gas, increases the risk of catastrophic events associated with "small" warming. For example, increases in ocean temperatures will lead to the release (this time, the temperature, not the pressure) methane from methane hydrates deposits (Byalko, 2009). Methane is also a greenhouse gas, so the increasing of its amount in the atmosphere will lead to an even greater increase in global temperature. As a result, the risk of accelerated melting of modern continental glaciers increases substantially. This, in turn, can lead to flooding of large areas in a very short time. The vast majority of modern cities and much of the agricultural land may be under water. Sea level in the previous transgression associated with the same cycle (about 26 thousand years ago), has risen to 25 meters higher than at present. In Europe, this transgression is called Onega, in Siberia - Karginskaya, in the Mediterranean - the Monastery one. Raising should expect nothing less in the current warming. It is possible that sea level rise will be even greater because of the additional contribution of anthropogenic carbon dioxide. Pettersson, Otto, 1914a, Climatic variations in historic and prehistoric time: Svenska Hydrogr. Biol. Komm., Skriften, No. 5, 26 p.
Yurkovets, Valery, 2011a. Climatic Correlations. Proceedings of the Russian Academy of DNA Genealogy (ISSN 1942-7484). 4(8):1633-1659. Yurkovets, V.P. 2011b. Caspian-Black Sea-Mediterranean climatic, archaeological, and paleogeographic correlations. INQUA 501 Seven Plenary Meeting and Field Trip "Caspian-Black Sea-Mediterranean Corridor during last 30 ky: Sea level change and human adaptive strategies" (2005-2011) Abstract volume: 195-201.